In addition, you will learn the steps you should take to be accountable for your actions during an incident. 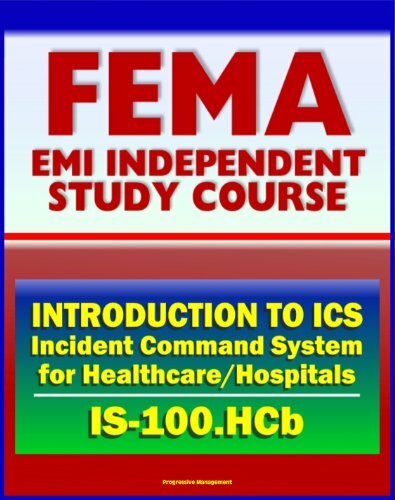 Primary Audience - ICS-100, Introduction to ICS (ICS-100.HC) should be completed by the hospital personnel that would have a direct role in emergency preparedness, incident management, and/or emergency response during an incident. Personnel designated to fulfill ICS roles (i.e. hospital emergency manager, hospital administration, department heads) should complete ICS-100, though additional participants may include the following hospital and healthcare systems staffs: * Physicians * Nursing * Ancillary * Materials/resource management * Security/safety * Laboratory * Radiology * Inter-facility transport. As a bonus, this compilation includes Terrorism and Other Public Health Emergencies, A Reference Guide: a comprehensive book covering all aspects of terrorism and the threats posed by biological, chemical, and radiation agents. Planning For The Unthinkable: Preparation And Response In Public Health * Biological Agents * Chemical Agents * Radiation Emergencies * Terrorism And The Food Supply * Environmental Safety And Testing * The Role Of The Federal Government * Self-Care For Media * Range Of Public Reactions * Risk Communications During A Terrorist Attack Or Other Public Health Emergency * History Of Biological, Chemical, And Radiation Emergencies * Acronyms * Selected Web Sites * Epidemiology Glossary * Descriptions of Selected Sections of Acts Related to Public Health Emergencies * Family Disaster Planning—Five Steps to Safety * Disaster Supplies Kit * Personal Workplace Disaster Supplies Kit * Self-Monitoring Checklist * Reducing Stress and Renewing Energy * Helping Children and Adolescents Cope with Violence and Disasters.